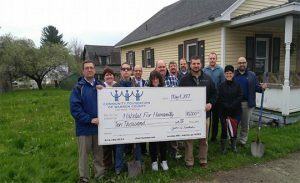 The Community Foundation of Warren County recently donated $10,000 to Habitat forHumanity. The donation is to be used to purchase materials for the construction of a house that is to become a permanent family residence in Clarendon. The construction is a challenging undertaking, and is the dual effort of the school district and Habitat for Humanity. The house is currently located at the Warren County Career Center, but will be moved as soon as construction is completed. The house’s address will be 103 Railroad St. in Clarendon, and is located in an empty lot less than a quarter mile from Main Street. The property was donated to Habitat for Humanity by Clarendon Borough. Currently, plans are being made for another housing project, this time for a property located on Beech Street in Warren County. “Our Site Selection Committee worked with the City’s Redevelopment Authority to obtain the property on Beech Street. We anticipate construction starting in the fall of 2017, once again at the Warren County Career Center,” according to DelPrince. Anyone interested in volunteering, applying for housing or staying up-to-date with Habitat for Humanity news can visit http://habitatwarrenpa.org/ or call (814) 688-8671.